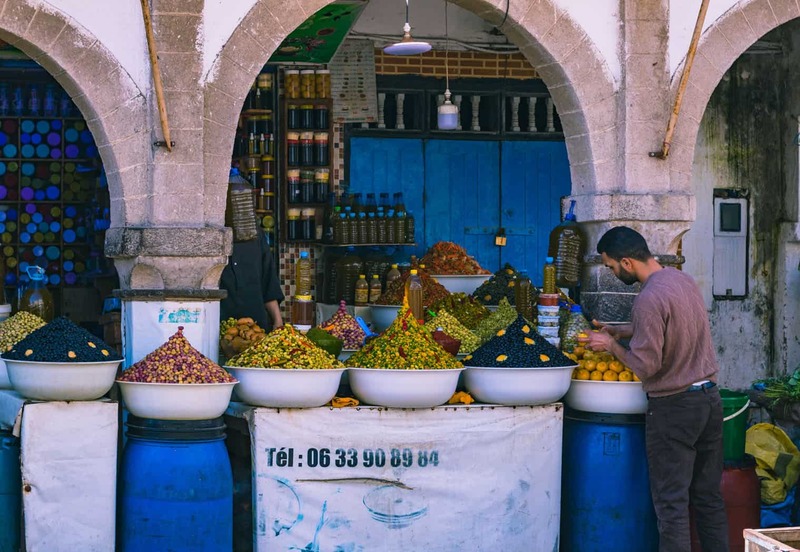 There are truly are SO many things to do in Morocco, it would blow your mind if this list was actually complete (which I do plan on doing because I’m already dying to go back). Instead, I’ve shared what I think are the truly badass things to do in Morocco and what I enjoyed most during my nearly three months exploring the country. Spoiler alert: Pretty much everything I did was amazing, so settle in for a long but quick list with TONS of pictures. Should you want more info on anything you see here, I probably have a blog post on it! Everything is linked within the post and at the bottom. …is the BEST way to see it. Yes, most of the roads are good enough! 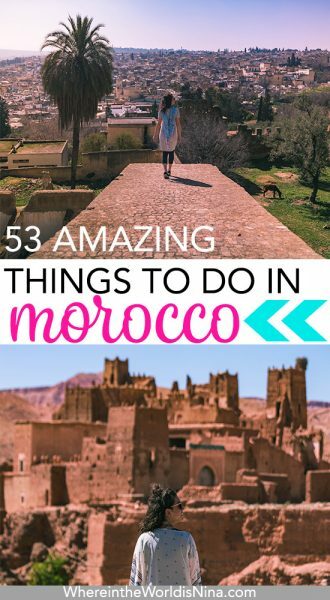 We wouldn’t have seen half of the things on this list if we didn’t drive around Morocco. It’s one of the best things I’ve done on my travels so far. OK I said MOST of the roads are good. When you go off on an adventure you may come across a stream that your non-4-wheel drive may need to cross. I definitely had to get in there and move a few big rocks. haha. …and waltz around like a local. Garrett fell in love with Jellabas and HAD to have one. I have a beautiful light green dress with gold detail (first photo). It’s fun to shop and attempt to blend in. …(the ethical way). Yes, not a joke. 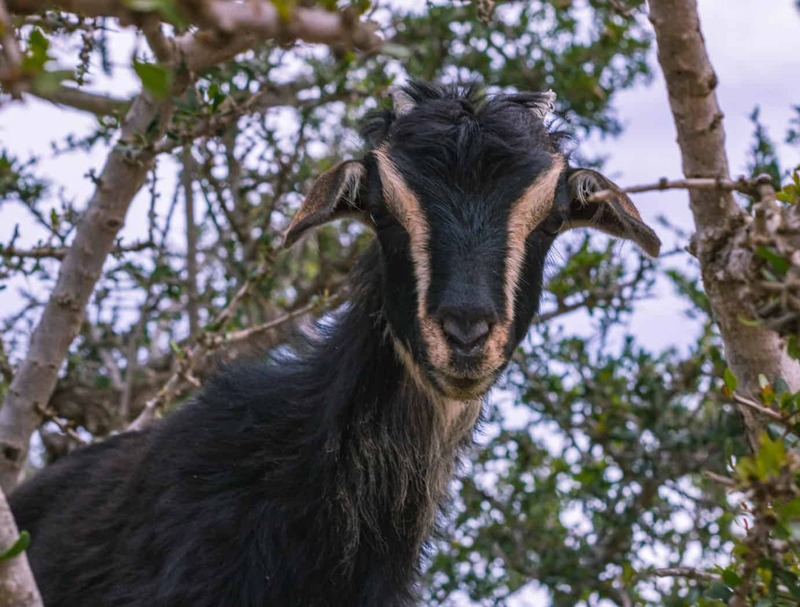 These cuties can be found in numerous locations closer to the coast and pretty much anywhere argan trees sprout up. Keep your eyes peeled if you’re taking a road trip. We stumbled upon them rather serendipitously. Isn’t he just the CUTEST! While seeing them is a cool thing to do in Morocco, just make sure you do it right! 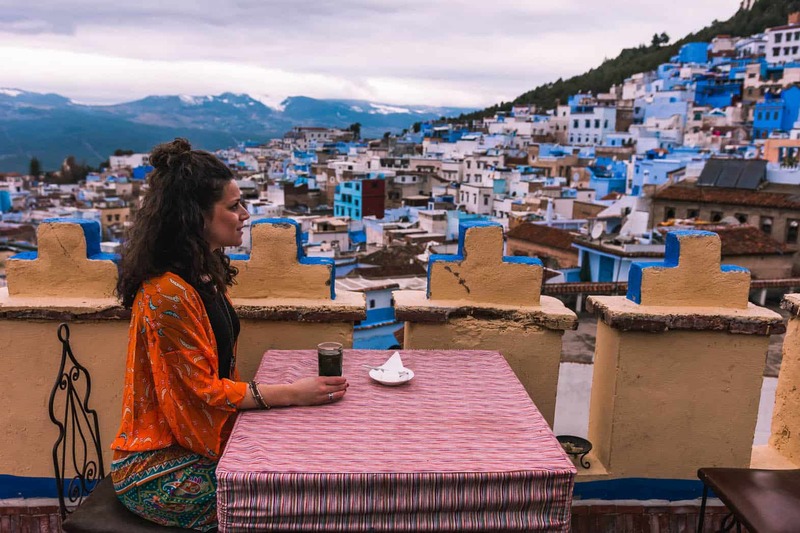 …in Chefchaouene. It’s seriously one of the cutest towns I’ve ever seen but that’s about its only thing to do—wander the blue streets! If you want to get more adventurous, there are hiking trails in the Rif Mountains which surround Chefchaouene. Dudes, YES, it’s really windy! 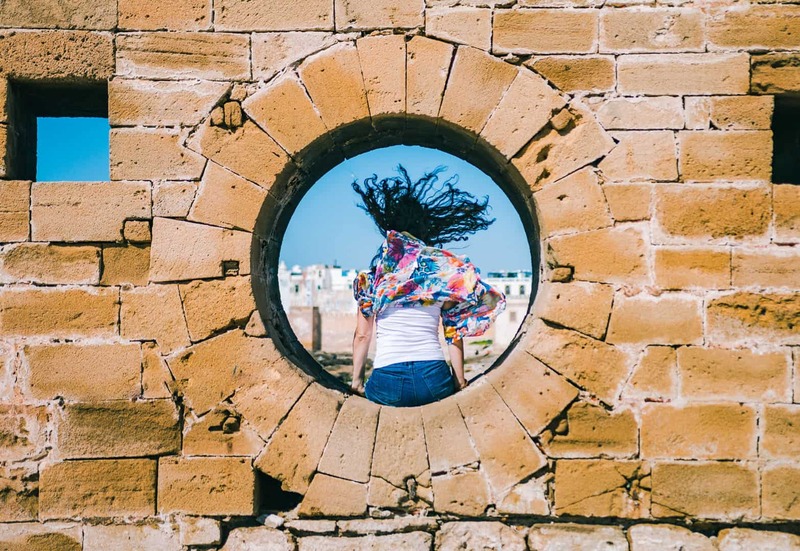 …for the best views of the old medina of Essaouira. That’s where the picture above is from! And yes, that’s the wind, this is not staged or Photoshopped. …in this adorable sleepy surf town. Or get your surf on, of course. There are only a handful of cafes, surf shops, and hotels in the area. Oh, and camels roaming the beach too! 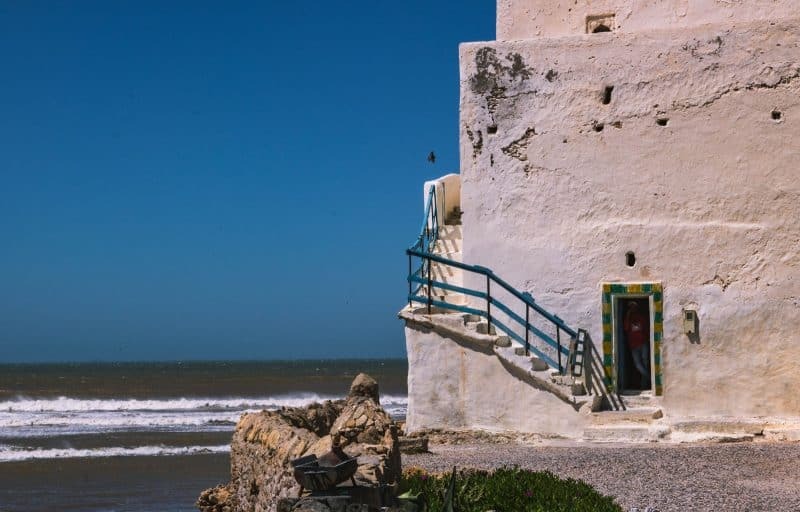 Sidi Kaouki’s surf and overly laid-back vibes make it worth a visit. Well, you actually have no choice. It’s impossible NOT to get lost in this labyrinth. The old walls are incredible to wander around. Well, any of the teas you’re served actually. It’s SO good! The mint was my fav. You literally throw branches of mint into your glass or the teapot. We ordered one each time we went out to eat. It’s super stinky here! I’m not into leather (or dead animals) but I know this is definitely a must see while visiting Fes. It’s quite interesting to see the process but definitely a bit gross to be surrounded by hundreds of hanging skin. A love you never thought was possible. Eat them every day. Pro tip: Blow your budget on olives. #worthit. jk, they are actually pretty cheap but yeah, we ate olives pretty much every day! I never had olive oil so much in my life and it was glorious. An oil that’s somewhat treated as a luxury ingredient is suddenly cheap, available, and used in everything. It’s so good! It literally went on almost everything we ate and we gave up butter entirely. Who needs to butter their bread when you can dip it in olive oil anyway? …to catch the longest right-hand break in the country. And maybe even get lost here for a few days (or a few weeks, whatever). The waves here were so clean. And it was pretty epic to see the pros slay the big barrels and then to have my turn at the same wave after it got way smaller as it crept up on shore. 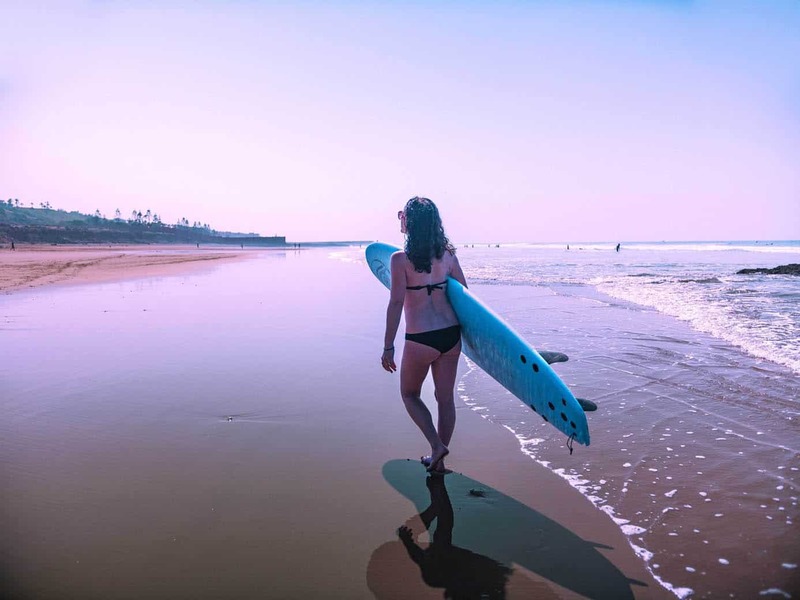 This is one of the best things to do in Morocco for surfers! Or wannabes. You can literally ride this wave for two minutes! I’m all about animals being treated well so definitely do your homework. But the desert experience I had treated their camels very well. They roamed the desert until it was time for a ride around some sand dunes. They are so cute and sweet and when you get to the desert, you will literally see herds of them! …and chill at the beach all day. The arch is a cool thing to do in Morocco and while its known, it wasn’t busy at all! It’s quite magnificent and the tiny town of Legzira is super cute with its hillside cafes and surf shops. We had a mean fish tagine while we were here, perhaps our fav tagine ever. Legzira is a popular place to visit because of the beautiful arch. FUN FACT: There used to be two but the other one fell! …which offer a great viewpoint of Fes. The arch that overlooks the city makes a dramatic backdrop and is a cool local goat hang out spot. Hands down this the best thing to do in Morocco. 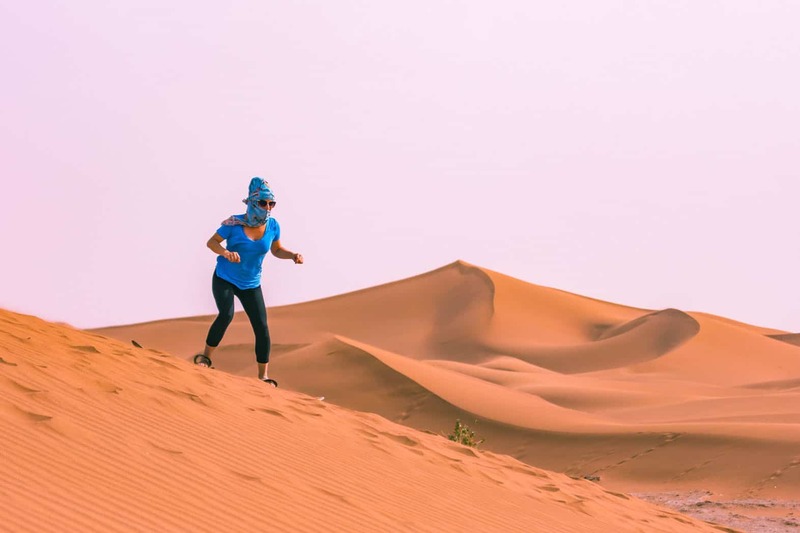 Clamber up the sand dunes of Erg Chigaga as opposed to the more touristy Merzouga. The dunes are wilder and you won’t be sharing the view with 100 others. 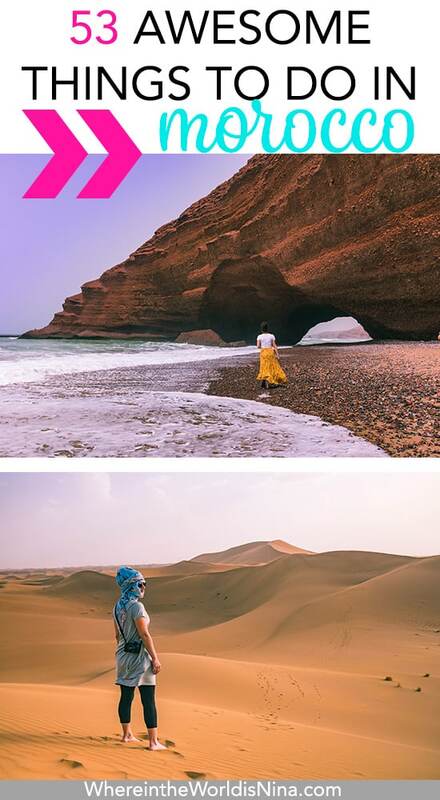 Literally, the hottest thing to do in Morocco. I can’t even tell you how incredible it is to see the Sahara Desert. …or get totally lost if you have more time, in this tiny cute town. I see this perhaps becoming one of the best places to visit in Morocco. Beaches, surf, and an overall lax vibe—What’s not to love? …before turning in for the night at Mirleft’s old Spanish fort hilltop ruins. 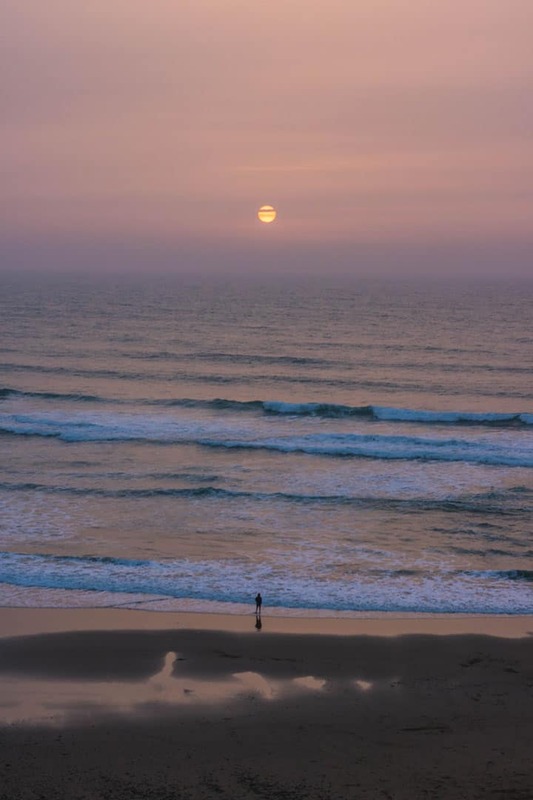 Mirleft sunset – things to do in Morocco! 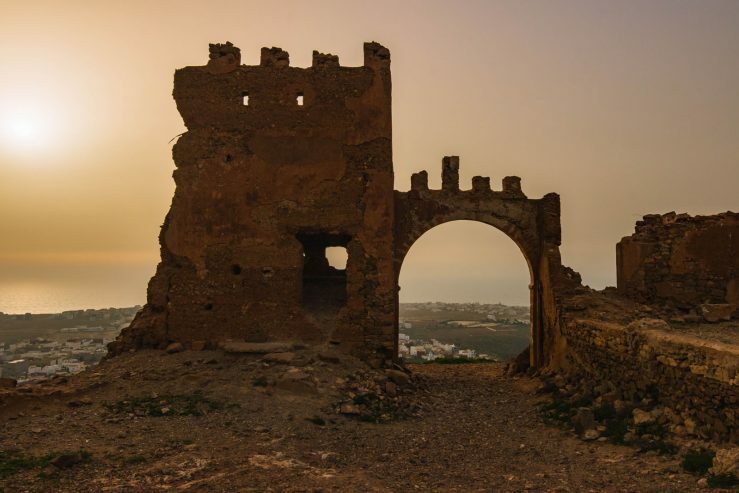 Ruins in Mirleft- things to do in Morocco! …and become a surf-riding badass within a week! 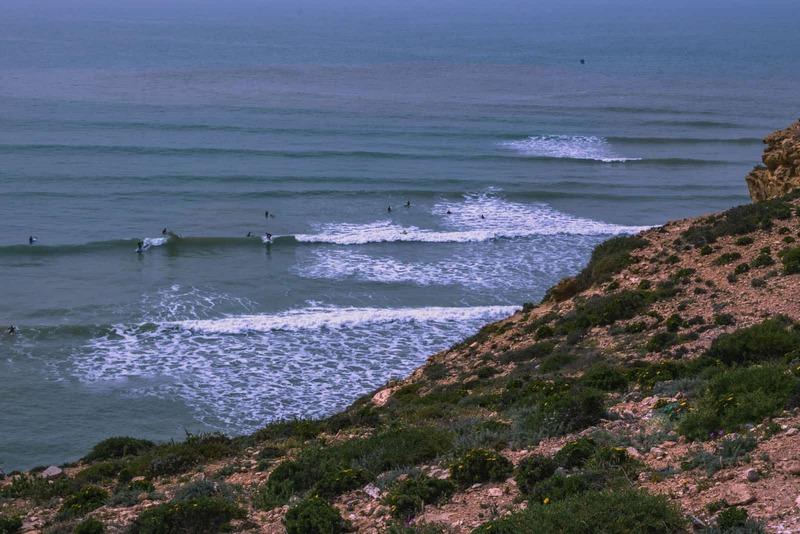 We found Taghazout to be the best place in Morocco for surf lessons. Easy chill waves, reasonable prices, and cool coastal vibes. I’m like soooo pro you guys… jk. But I felt like a badass! Because they will definitely wave to you. It was super cute. 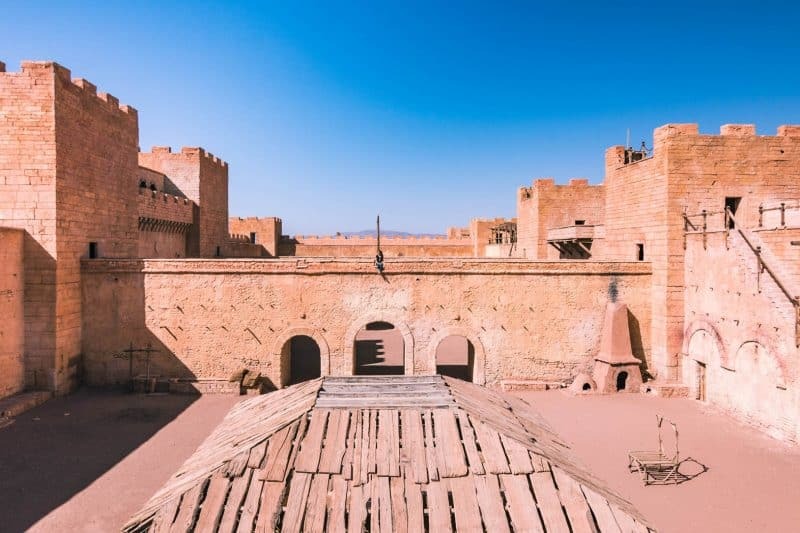 My absolute favorite kasbah was Telouet which is just about an hour north of Ouarzazate. 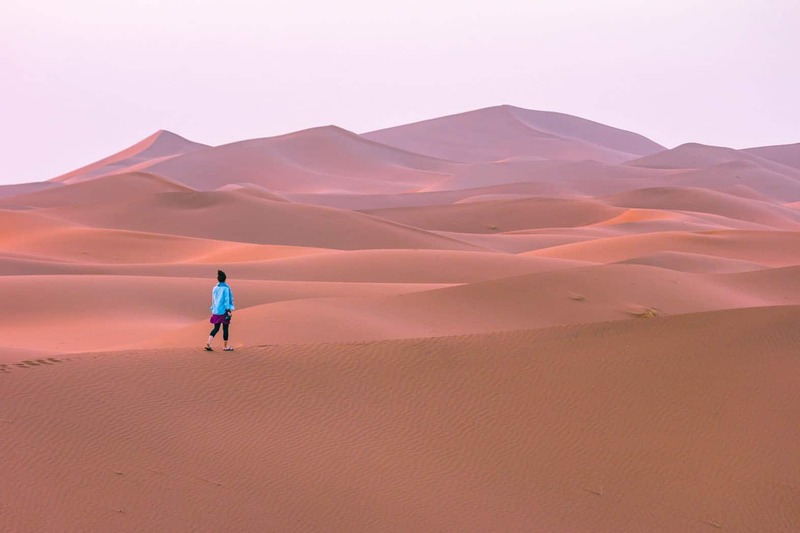 This is moving up on the best places to visit in Morocco list fast! Ait Ben Haddou makes more of a splash being that it was featured in Game of Thrones (as well as some other films and shows) but Telouet is a far better place in my opinion (AKA fewer people). 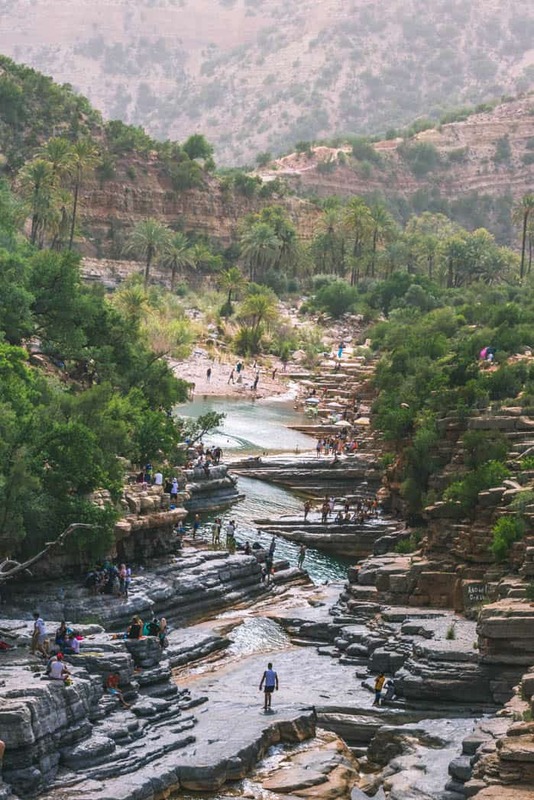 There will be tons of kasbahs to visit, they are super popular places to visit in Morocco. But like, is this real life! ?—Telouet Kasbah was one of my favorite things to do in Morocco. …in Marrakesh and leave empty handed (good luck). This may be known as a hectic market and I only went to wander around but I left with two pairs of earrings anyway. I would have got more if I didn’t just shop in Agadir. It’s a ridiculously gorgeous abandoned mosque outside of Imlil. This structure is SO incredibly beautiful. And if you’re a non-Muslim, this will be the only Mosque you can actually get into! Tin Mel’s abandoned mosque isn’t too well know yet. So before this becomes THE thing to do in Morocco, you maybe should go. Nobody was here when we were! …with all the old movie sets, particularly the one in the back which has played host to over 200 movies, including the Game of Thrones. We clambered around the set for hours without another soul around us! GUYS! I’m a movie star. Look at meeee! Yes, this is a real-life movie set. Pretty sick they allow you to climb all over it, right? It’s simply all there in the name of art and is pretty cool. 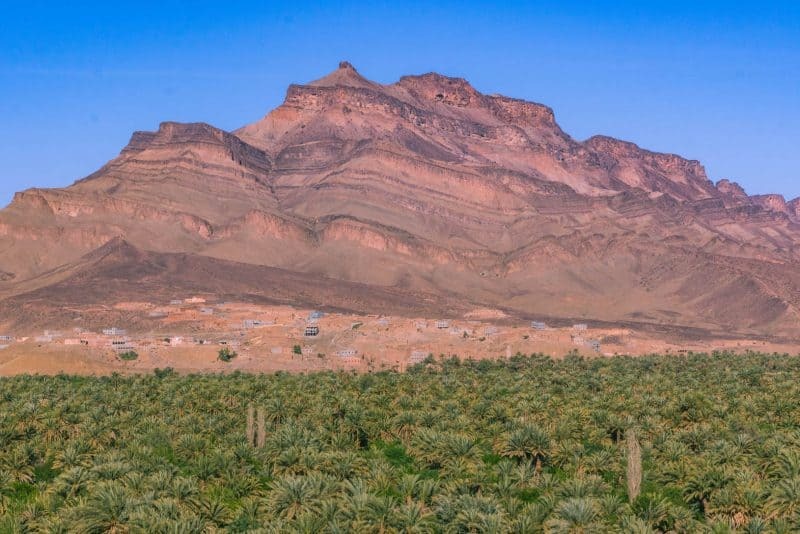 Surrounded by desert, a Belgian artist colored a bunch of rocks pink and blue, apparently for his late wife. …and up on the hill for an awesome view. 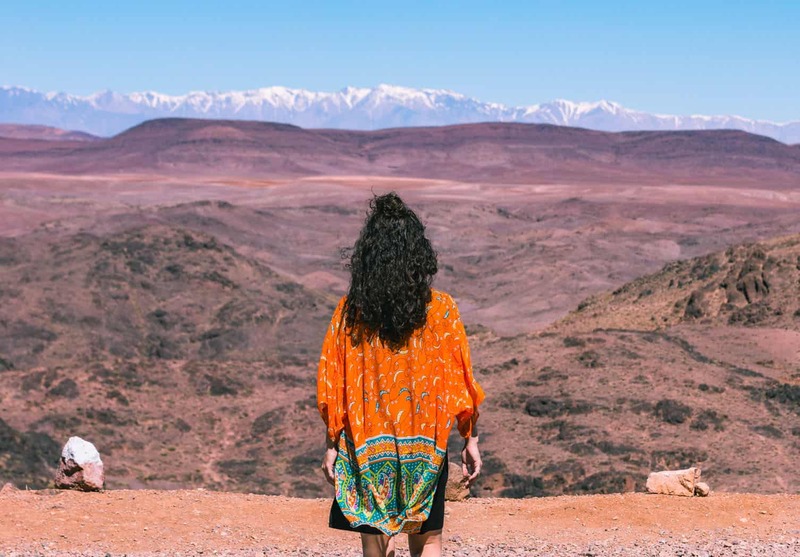 This is a cool getaway from Ouarzazate. …(and nowhere else!). The coast has some delicious fresh fish. Anywhere else and you may be sorely disappointed. The sea of palm trees with a multilayered mountain in the background—it’s incredible. How beautiful is Agdz! 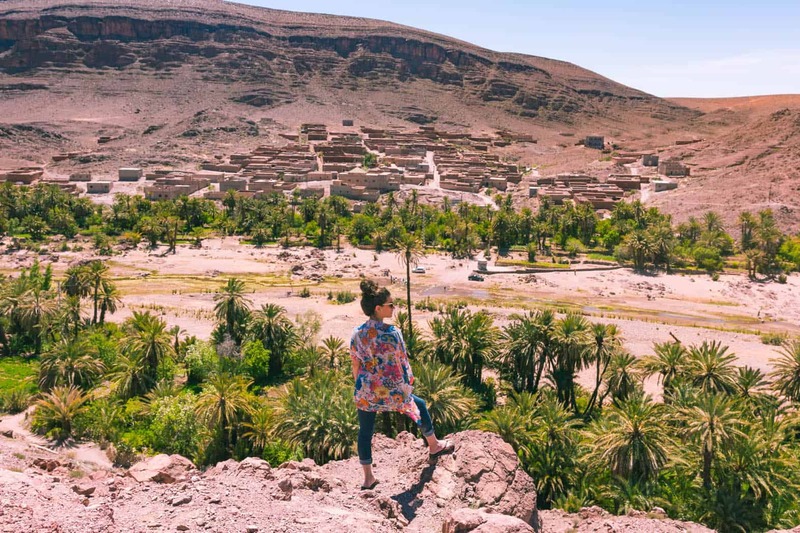 This is a cool thing to do in Morocco because it’s regularly skipped by people flocking to Zagora. Only to say hello to the smiling cop and tell them where you’re going. Smile and drive on. This happened to us twice and it was actually super adorable. They are not after tourists, so if you’re following the traffic rules, you’re fine! 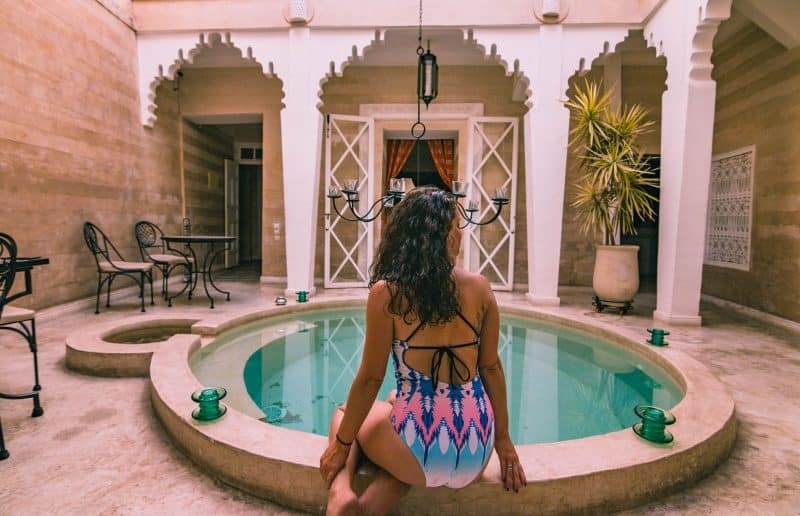 I rarely care where I stay, and while I didn’t make a massive effort to stay in any crazy ridiculously expensive riads, I found a cheap one and enjoyed it. Fully. 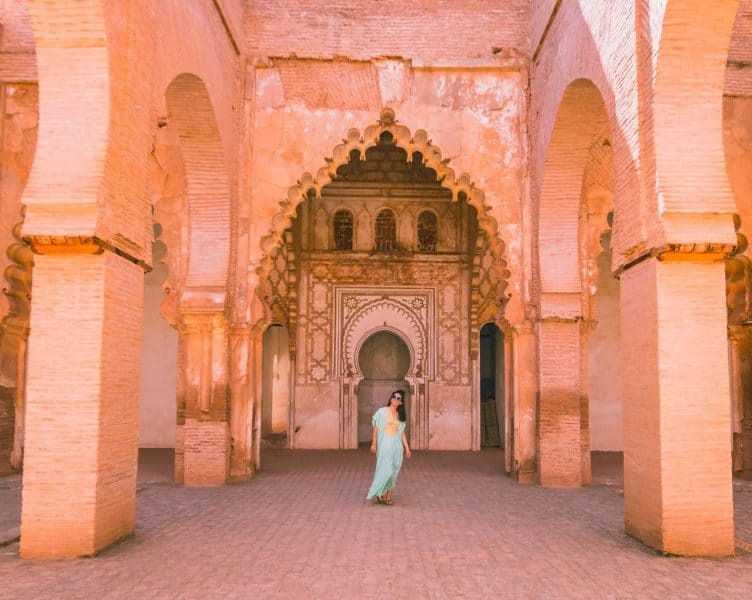 Staying in one is a popular thing to do in Morocco and can certainly count as an experience in itself! 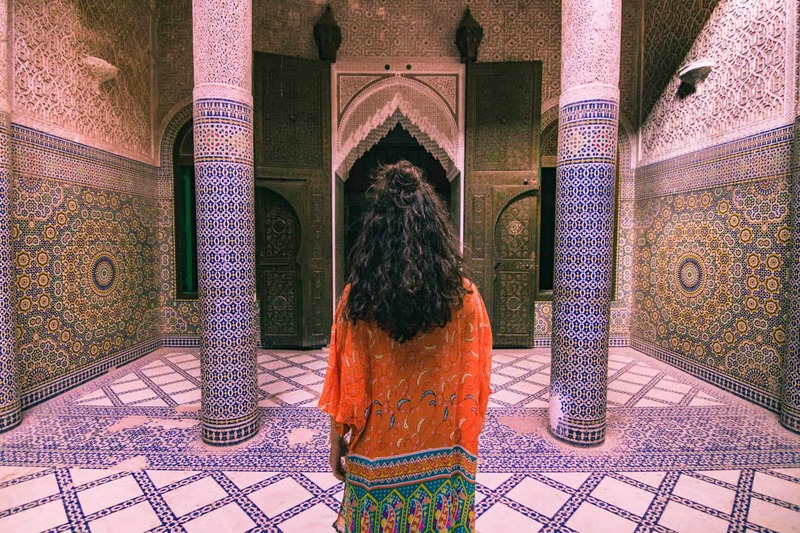 Riads are definitely a thing to do in Morocco but don’t get caught up in staying in them all day taking pictures! There’s too much to do! Bonus points if you learn it from a local for proper pronunciation (and interaction with a new local bestie). I’m hot down here but you can see snow in the background on the Atlas Mountains. …from almost anywhere in the country! They take over so much of Morocco, you can even see them driving to the desert! They are ridiculously beautiful and dramatic. …at Paradise Valley, sans alcohol of course! But this place is usually pumping with people having fun, cliff jumping into the large pools of water, and sunning their buns. Just make sure to go when it’s actually wet! Paradise Valley makes for a great half day trip from the coast. 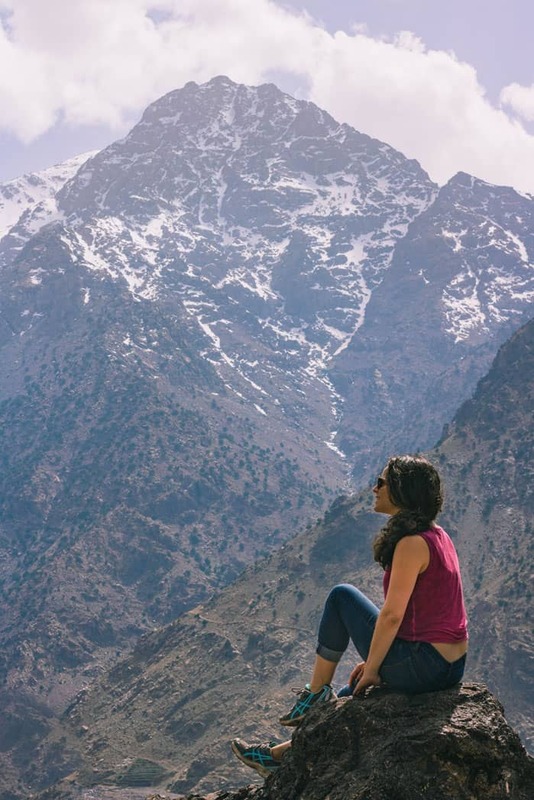 Paradise Valley is a popular thing to do in Morocco! We found one in Ouarzazate for 2.50! And a bottle of wine for under $15…it’s like a treasure hunt in the smaller towns to find alcohol for a reasonable price. It’s also totally fine NOT to drink. But after nearly three months without alcohol, we felt we deserved some when we actually found it. …up to Toubkal or just around the valleys if you’re not that extreme/don’t have enough time. This may be the closest you will get to snow depending what time of year you come. 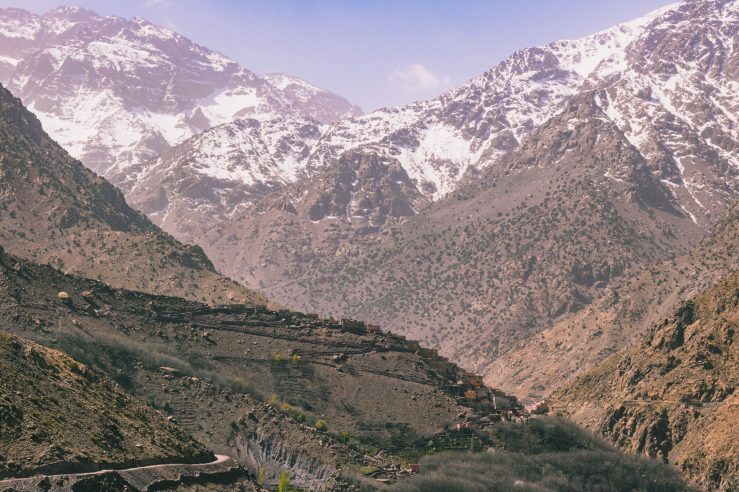 Here’s a guide to a day in Imlil. …for that matter! 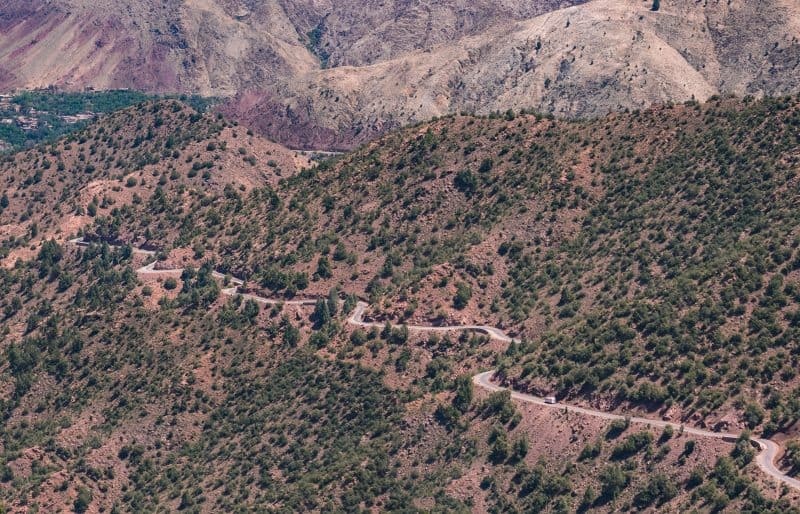 Some of the mountain roads in Morocco are certainly intimidating but they are also super gorgeous and kinda fun too. …for trinkets and good deals. It’s less intense than the Jemaa el-Fna in Marrakesh and you may even find some better deals here. Almost every place has them. Restaurants, your hotel, cafes, get up there. 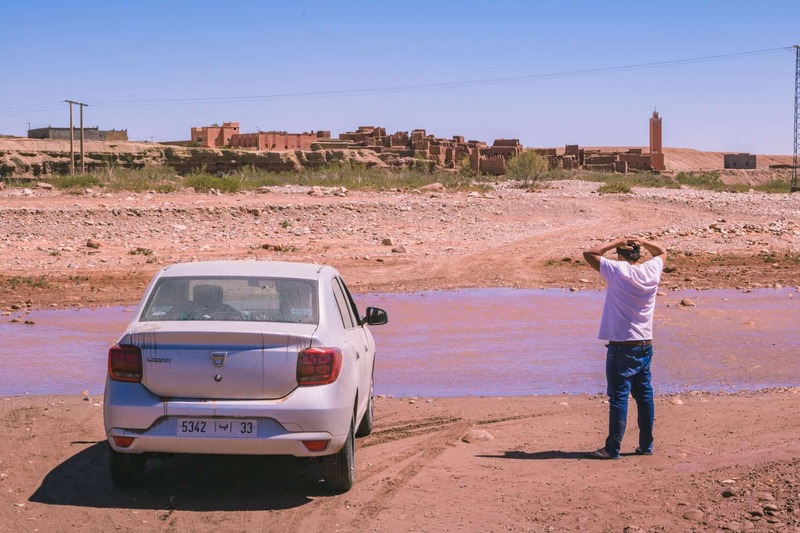 …in a random village (or 10) while taking a road trip through Morocco. There are so many adorable villages to just sit and forget that time exists. They also have some of the most epic viewpoints. Somewhere outside Ouarzazate getting lost. …on the side of the road. It’s OK if you don’t know what you’re getting, just buy it. We came home with a few mystery ingredients ourselves. Just don’t fail like I did and look like you’re riding an imaginary bike (or pooping, whatever) in your picture. Oops. …every day for brekkie. Nom nom. This is the only bread we ate for three months. …in the middle of the day for a quick snack so you can keep going. There are little stalls selling these stuffed crepe-like things everywhere. It’s can be a sweet or savory snack. …and see the colors change drastically from one moment to the next. Pinks, yellows, oranges… they all come out to play! It’s mind-blowingly beautiful and one of the coolest things to do in Morocco. My desert experience was magical and I have a guide telling you about the non-touristy way to see it. 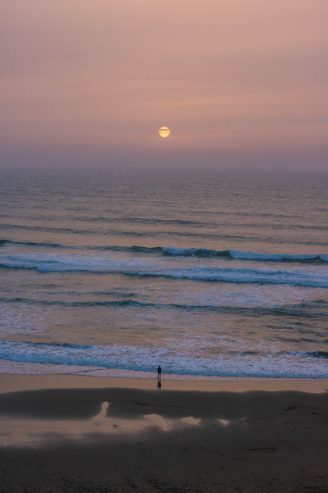 Morocco desert tour = incredible sunrises. Look at the colors! …and spot as many constellations as you can. The sky is so clear and uninterrupted with light pollution, you rarely get to enjoy a moment like this. …properly in a turban. Either buy the fabric for super cheap or use a scarf that you have already. Phew! Wow. Did I go a bit overboard here? I mean, Morocco has catapulted to the top of my list of favorite countries so it’s only natural that I made a massive and ridiculous list like this to share with you guys, right? What kind of friend would I be if I kept all this cool stuff to do to myself? 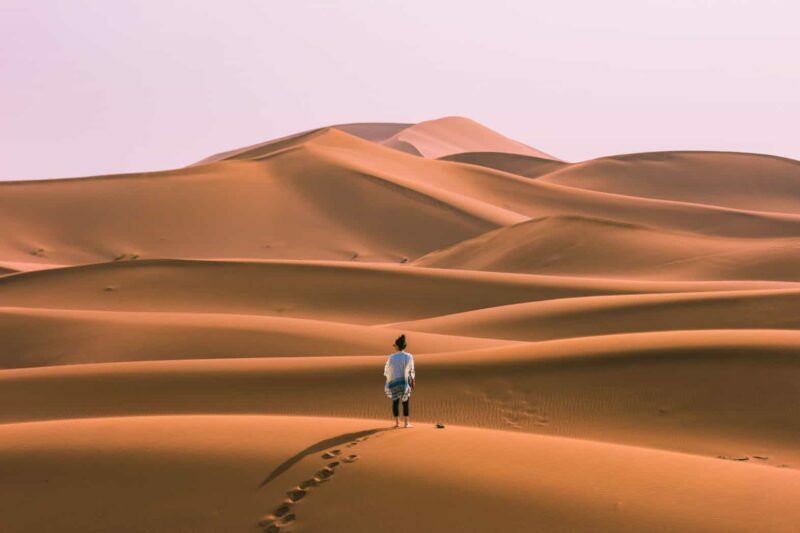 I hope this helps you get an idea of all of the best places you can visit in Morocco and I hope you’re inspired to go. 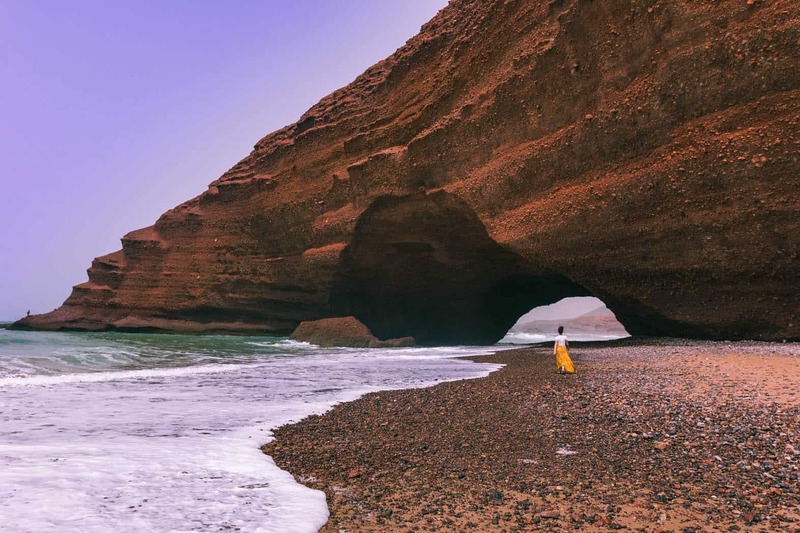 Which of these beautiful places in Morocco will make it on your list? Let me know your plans! Click the picture and pin it before you lose it! I am planning a week in Marrakech as my base and will be traveling with 7 & 9 years old. 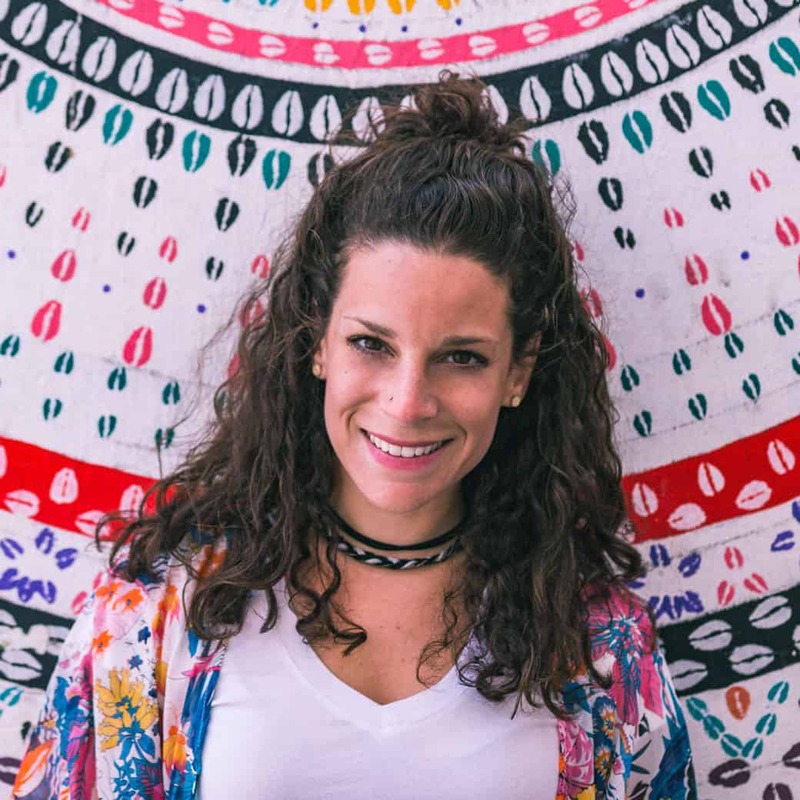 You got so interested in visiting the desert and staying at that Airbnb, but it appears that the distance from Marrakech is about a 7.5 hours drive. 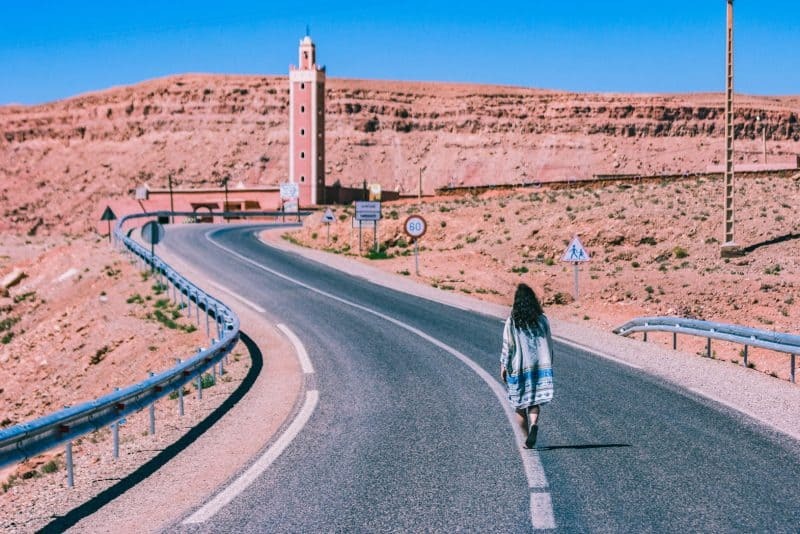 Did you drive from Marrakech directly to the airbnb or did you make other stops along the way. I would love to give the kids the experience of the desert or for it not to be Ultra Touristy. And was the driving in Morocco and were there any concerns.. Thanks a million for any feedback. We were on a road trip and we weren’t driving to and from Marrakesh. This is the itinerary. Have fun! This was a fun read. Too bad I found this after my trip to Morocco. But at least I can use these tips when I go back. 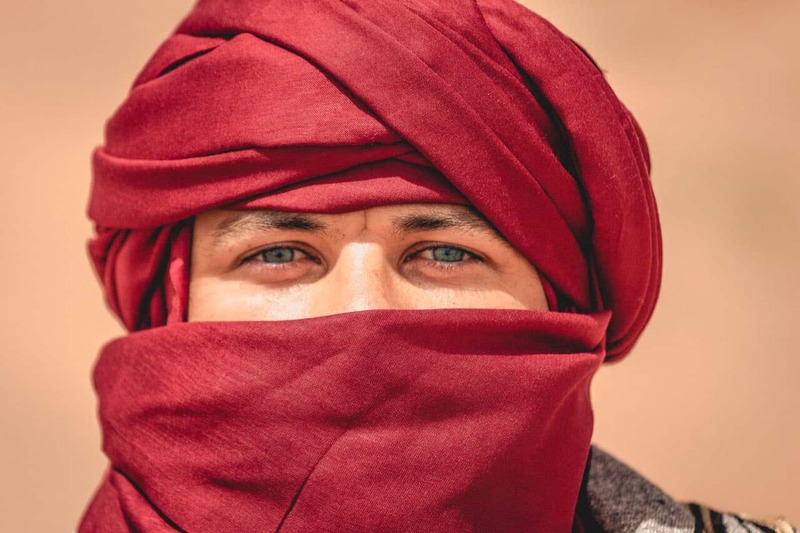 I was in the Merzouga in April and it was amazing. Not quite what I was expecting to be in the desert. Maybe one day I’ll visit the Erg Chigaga to see how it’s different. Thanks for these tips! I’m planning to return as well! I’ve seen so many posts about Morrocco recently I’ve been dying to go! How is it for females trabeling solo there? You’ll be fine 🙂 I walked around most places alone even though I was with Garrett to get the feel and it’s not that bad. Yes, you’ll get hassled in the bigger cities for sure, but nothing that made me feel unsafe.